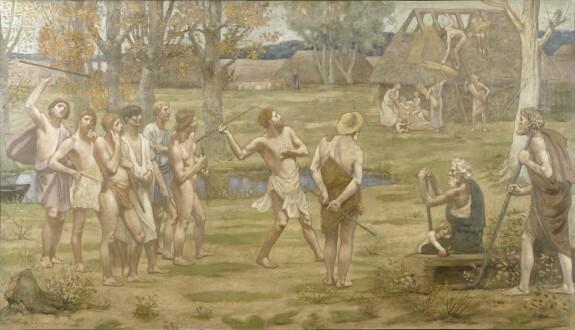 Description In the late 19th century, Puvis de Chavannes was an innovative and influential figure, working in a style that combined aspects of Romanticism, Academicism, and Symbolism. He was particularly known and admired for his mural paintings, which graced the walls of public and religious institutions from the Panthéon in Paris to the Boston Public Library. This painting replicates the central portion of a mural, Ludus Pro Patria (Patriotic Games), which was installed in the stairwell of the Musée de Picardie in Amiens, France. It recalls a "Golden Age" in the history of the province of Picardy and is devoted to the themes of work, family, and country. Celebrated Paintings by Great French Masters. National Academy of Design, New York. 1887. Exposition des Tableaux, Pastels, et Dessins par M. Puvis de Chavannes. Galerie Durand-Ruel, Paris. 1887. Glasgow International Exhibition. Kelvingrove Park, Glasgow. 1888. Provenance H. V. [Vever (?)] Sale, Paris, 1897, no. 92; Henry Walters, Baltimore, prior to 1909 [mode of acquisition unknown]; Walters Art Museum, 1931, by bequest.